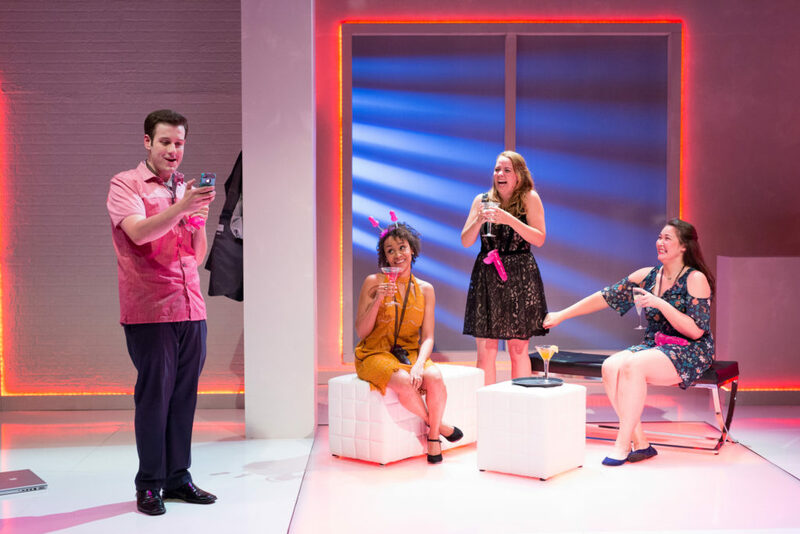 (Boston, MA) Significant Other (SO) is Sondheim’s Company is the music were stripped, and Bobby was made both gay and genuinely likable. The percentage of justifiable choreography remains equal between the two shows. The set design is similarly simple. The scene transitions are more facile. All in all, based entirely on sympathetic characters alone, Significant Other is the more pleasant viewing choice. Whether this is true for you depends upon your own theatrical preferences. Jordan (Greg Maraio) is a successful young man with an amazing apartment and four of the best friends a single dude in his late 20’s could ask for. Unfortunately, he’s been single for so long that he doesn’t know how not to be. As each best friend falls in love and marries (except for Grandma played by the effervescent Kathy St. George), he can only watch as his OCD wrecks his peace of mind. Jordan wants to find a husband of his own. We can only watch as he stumbles awkwardly towards misery. Dating is terrible; it’s the worst. There are no tortures humanity purposefully endures quite like the one to find a romantic match whose crazy matches one’s own. Jordan, who bombs again and again, is an adorkable anti-hero with obsessive tendencies who just wants to be loved. Maraio’s portrayal of this flawed, desperate man is kindhearted and generous. Jordan could easily be detestably selfish but under Maraio’s care, Jordan is sweet and complicated. Maraoi’s physical comedy is smooth and fun. Joshua Harmon’s female characters exist to support Jordan. They disappear as soon as they’ve served their purpose only to reappear to support Jordan again. Kiki (Sarah Elizabeth Bedard), Laura (Jordan Clark), and Vanessa (Kris Sidberry) are lovable characters whose background stories serve only to make them marriageable. They pretty lamps with notes pinned to them. Bedard, Clark and Sidberry makes these flat characters that exist to get married and support Jordan beautiful. Truth be told, I was too busy falling into platonic love with these women to notice if Significant Other passed the Bechdel Test. It might do. I was too focused on the great performances. Daigneault’s staging is blissfully natural despite SO’s campy accents. His cute wedding choreography is equally as natural, and brings out the quirks of Harmon’s characters. These elements combined make the show’s fantasy sequences ring with truth even as the audience gasped with giggles or other*. Significant Other is funny and depressing. Single people will identify with Jordan’s plight. Couples will thank their lucky stars that they don’t have to date anymore. Happily married couples will beg their spouse to never abandon them in this terrifying time of email, Tinder and texting horrors. Jordan’s situation is comedic because it’s real. It’s also tragic because it could be any one of us up there. *Insert shout out to Jared Troilo’s pecks and arms here. This entry was posted in Comedy and tagged 2016, Bechdel test, Boston, boston center for the arts, Calderwood Pavilion, Dating is the worst, Greg Maraio, Jared Troilo, Jordan Clark, Joshua Harmon, Kris Sidberry, MA, October, Paul Daigneault, Sarah Elizabeth Bedard, September, Significant Other, Speakeasy Stage Company by Kitty Drexel. Bookmark the permalink.